TechPowerUp delivers word that NVIDIA will introduce three new technologies. First up is TXAA, a new super-efficient temporal anti-aliasing technique with two levels; TXAA1 and TXAA2. 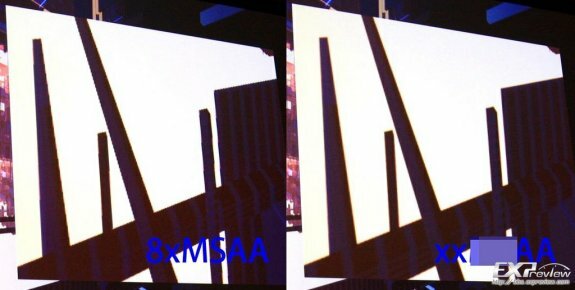 The TXAA1 mode promises image quality comparable to 16x MSAA with the performance-penalty of 2X MSAA, while TXAA2 promises image quality higher than 16X MSAA with the performance penalty of 4X MSAA. The TXAA technology can be enabled via the NVIDIA Control Panel, since few games natively support it. Next is adaptive V-Sync, a smart frame-rater limiter that aims to prevent tearing and reduce stuttering by adjusting VSync depending on frame rates. When the framerate is lower than the display refresh rate, overclocking will attempt to overcome lag, and when the frame rater is higher than monitor refresh rate, normal V-Sync takes over to prevent page-tearing. Also new is 3D Vision Surround, which enables 3D gaming with up to four displays per GPU. The 3D Vision Surround technology works in conjunction with Adaptive V-Sync to ensure that the center display has higher framerate, at the expensive of the framerates of the side displays.